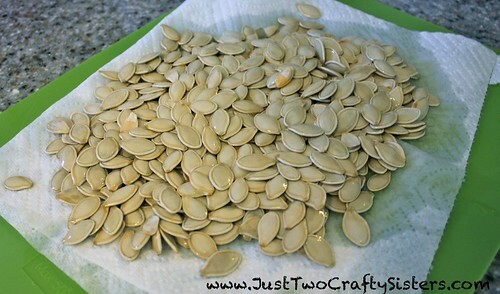 I found this idea on Pinterest from Copy Cake Cook for drunken pumpkin seeds and had to give them a try! 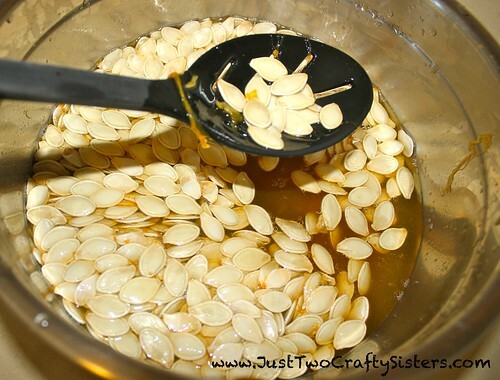 I love pumpkin seeds and have tried a few different recipes over the years, but never one with Whiskey involved! Since my hubby’s drink of choice lately has been Old Fashions, I knew we had plenty of Whiskey on hand to give this a try. 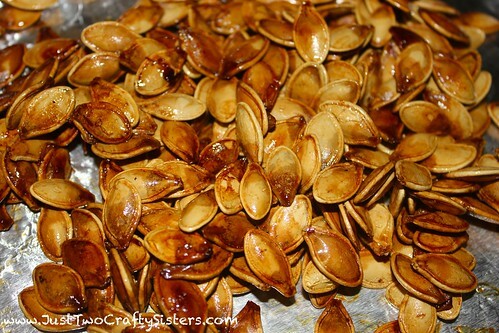 To start out I washed and dried my pumpkin seeds. The easiest way to wash the seeds I have found is to flood the bowl they are in and swish them around. Next use a slotted spoon to sift out the seeds from the pulp. 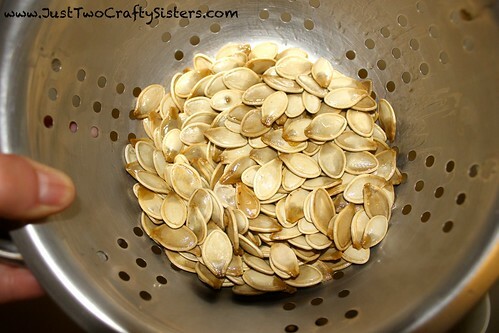 I then place the seeds on a paper towel covered cutting board to soak up the excess water. You can then pat dry to the best of your ability or simply let them sit out for a few hours in a thin layer to air dry. Now on to the drunken-ness! In a small saucepan over medium heat combine the seeds, whiskey, bacon drippings and brown sugar. (I was able to get some bacon drippings by planning on Jalapeno Popper Chicken for dinner so that I needed to make bacon.) Simmer for about 15 minutes or until the seeds turn a bit grey from soaking in the liquid. Be careful when breathing in over the pan, because the Whiskey vapors burn! 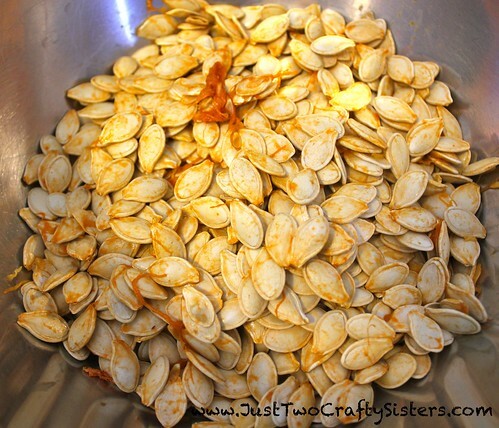 Drain out any excess cooking liquid and spread the seeds out on a foil lined baking sheet. Sprinkle with salt to taste. Bake at 275 for about 75-90 minutes crisp and brown. They come out a bit sticky and candied from the brown sugar, but harden as they cool. They have a great flavor and are not really boozing once cooked. Enjoy! 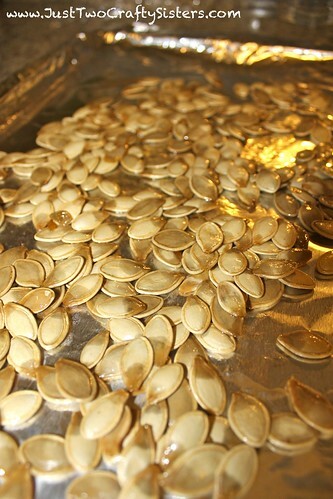 Looking for a good recipe for classic pumpkin seeds? 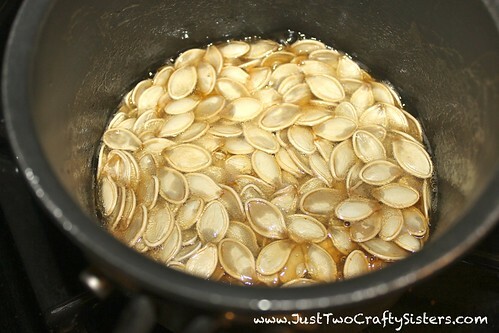 Check out how I make easy classic pumpkin seeds here. I have never tried it with already dried seeds. They may overcook and burn. If you do attempt, I would recommend reducing the time and watching them closely. Let me know how they turn out! Do you think I could start with dried unsalted sunflower seeds?